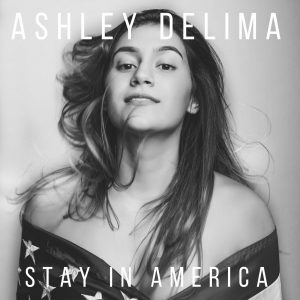 An Interview With The Inspiring Newcomer Singer-Songwriter, ASHLEY DELIMA! Meet the nineteen-year-old singer-songwriter, Ashley Delima. Ashley has a compelling story as she is American born and was raised in Brazil and now a resident of New Jersey. Ashley penned a song, recently released on January 26th titled “Stay In America.” The track is a shout-out of support from the daughter of Brazilian immigrants to those struggling to stay in the U.S. at a time when DACA – the Deferred Action for Childhood Arrival immigration policy that allows some individuals who came here as minors to receive deferments and work permits – is being threatened. We have no teen in the media that is standing out and being a face for DACA and Ashley’s song and platform is perfect for helping get the word out about this serious issue. Ashley is the only person in her family that will be able to stay in our country. Marc Swersky (Two time Grammy Award Winning Producer for Joe Cocker & Hillary Duff is the producer and Mark Needham (Fleetwood Mac, Imagine Dragons) did the mixing. Thanks so much for your time! We know musicians are busy people so we appreciate you taking the time to answer a few questions about yourself! So where does this interview find you today? Actually, at the moment I’m with my production team rehearsing songs for my debut NYC show at Rockwood Music Hall! Their twin toddlers are running around as we’re rehearsing. It’s actually really cute! We’re like a big family. world just giving back in return. I always knew that music was going to be a huge part of my life. Actually I feel like I took too long to start. It took me a while to realize that dreaming is just the first step. You actually have to put your dreams into action for them to come true. I’m now actively pursuing my dreams. Music has been a part of my life since I was 2. I remember watching Shakira and thinking I wanted to be just like her. When I was 3 years old, my mom bought a karaoke machine and would throw parties and all the adults would sing. One day, I tried it myself and I think I fell in love with the attention because I never stopped singing after that. I always like to ask artists about where they came from and how that city has influenced them as an artist. How do you think your home has affected you and your music? What was it like being raised in Brazil and then moving to New Jersey? My life experiences have all lead me to this point and the songs I’ve been writing are a direct reflection of my culture and my upbringing. Moving from Brazil to New Jersey was the best thing that ever happened to me. Life in Brazil was drastically different. I had a great childhood in Brazil but my teenage years were difficult at times. I battled depression, was bullied, and I felt like if I stayed I wouldn’t be able to pursue a better life. I feel like I was forced to mature very quickly because I moved here all by myself since my parents are not citizens. Since I have dual citizenship, I was able to come. What was it like writing your powerful recent single “Stay In America”? How creatively involved were you with the making of the music video for it? What was it like working with Marc Swersky and Mark Needham on the song? mind to new ideas and new musical genres. I’m so honored that Mark Needham worked on my song. I’ve listened to many of the records he’s mixed and produced and I admire his work greatly. I’m so excited to have him on my team! I understand that you are the only person in your family that can stay in America now. What has that been like for you? How has it affected the kind of songs that you are continuing to write? and going back to a time when it had the potential to change hearts and minds. As a newcomer in the music business, I am curious to know what you think of it all? What has been the most and the most challenging part about it all? It’s really hard work. There’s no way you will be able to last in this business if you’re in it for the wrong reasons. You really have to be driven and in love with it. It’s not all glitz and glam. Are you currently working on new music? When can we expect new music from you? Yes! I expect to release my debut EP in the late spring of 2018! Music gives me so much purpose in life. I feel like so much of life right now is about instant gratification and doing things really fast. When you sit down to write music, you have to give it the time and respect it deserves. You have to slow down! I think music actually should reflect the times. I hope that more artists start to write about what’s going on socially and politically. I think it’s going to happen. You have collaborated with so many incredible artists so I am curious to know which one stands out the most to you so far? I’ve had the great privilege of working with some amazing musicians including Daniel Sadownick (Maxwell, Taylor Swift, Kesha), Adam Jackson (Bilal), Vin Landolfi (Demi Lovato) and Alan Markley (Maggie Rogers). Bob Marley, Lorde, Russ, The Neighbourhood to name a few. I’m most inspired by Bob Marley because he lead with love and wasn’t afraid to speak his mind through music. Love, Hope, Empowerment, Freedom and Awareness. I’m already so humbled and excited by the reaction I’ve been getting from “Stay in America.” I don’t know how to let everything sink in. Maybe it’s best I don’t. I just want to keep putting my music out there and I hope everyone will still continue to listen. An Interview With RAD HORROR Front-Man, DYLAN JACKSON SCOTT On The Band’s Latest Music and More!